Montreal, June 2018 ● Alex More (charmingly played by Montreal English Theatre Award nominee Donald Rees) has hit a career road block when he catches a break and is hired for a mysterious job at an undisclosed location. What location? None other than the home of one of the greatest living legends, Barbra Streisand, who happens to have a mall in her basement! Presented by Brave New Productions (celebrating 15 years) as part of the St-Ambroise Montreal Fringe Festival, Buyer & Cellar runs from June 6-16 (see various times below) at Theatre Sainte Catherine. A hit at last year’s Canada Pride Montréal 2017 and BroadwayWorld Montreal Award nominated for Best Play and winner of Best Leading Actor, the show returns for seven final performances. Buyer & Cellar is an outrageous comedy about the price of fame, the cost of things, and the oddest of odd jobs. What would happen if an out-of-work, aspiring actor was hired to man the private basement mall in Barbra Streisand’s Malibu house? That was playwright Jonathan Tolins’ question after reading the beloved megastar’s architectural book My Passion for Design, detailing the setup of her own private mall, complete with dress shop, doll shop and working yogurt machine. Buyer & Cellar is the hilarious comedic answer. As Alex starts his job, he falls deeper into the rabbit hole of notions of fame and celebrity when he meets and befriends the great Babs herself. But will their friendship make it upstairs or is it simply a nice camaraderie between a boss and their employee? 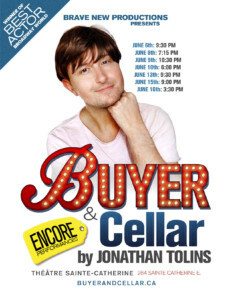 Buyer & Cellar is an extremely funny one-man show in which one talented actor plays multiple roles, while striving to examine life on the other side of the red carpet. BUYER & CELLAR 7 shows only! During the Festival: Tickets also available at the box office located at FRINGE Park (corner Rachel and St-Laurent) or at Theatre Sainte Catherine as of one hour before show time.